Nothing I love more than a casual look for the weekend. A cheeky sweatshirt and jeans are the ultimate weekend staples. With a pair of red heels and a matching red lip, these basic pieces get injected with a shot of glam. I have still been using Lyon & Post to fuel my online shopping habit and I have to say, it's been really great. The prices are a little steep, but the brands and quality of the clothing are luxurious so I think it's worth the splurge once in a while. I originally ordered this sweatshirt in a size small (my usual size) & found it to be short & fitted - two qualities that I did not want in a sweatshirt style top, so I was able to exchange it for a size large - for free! 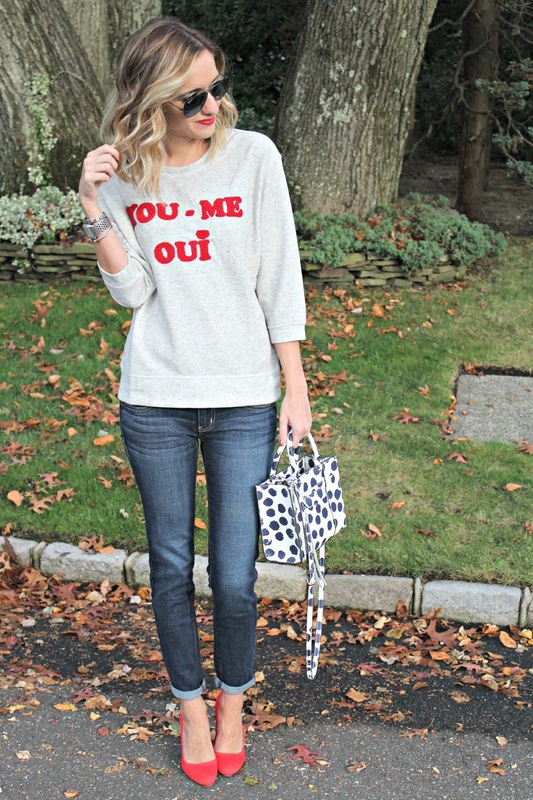 I love this fun sweatshirt and I love your bag with the red heels. Have a great weekend! 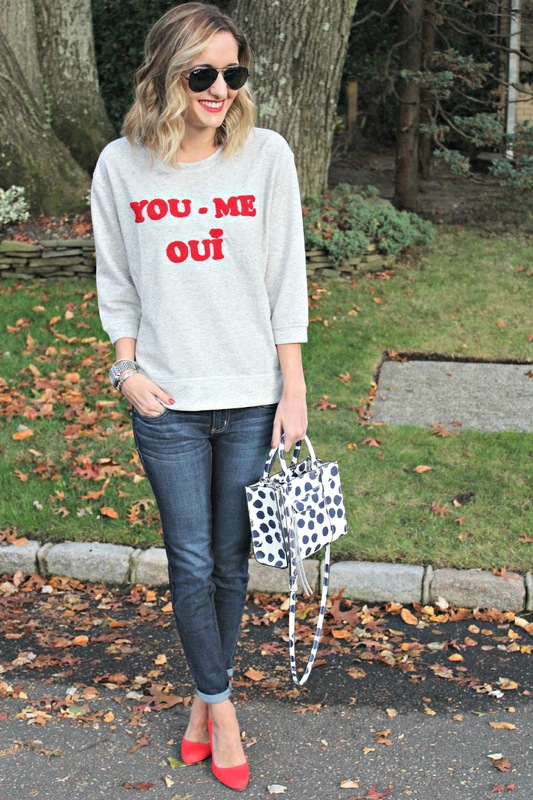 Love how you dressed up a sweatshirt with heels and the touch of polka dots is too fun! Thank you! It's so fun to take a casual piece & dress it up a bit. Being able to dress up a casual look is so important for Fall! I agree! I love versatile pieces! Love the bright red lips. Great weekend outfit. Have a fabulous weekend! Love the dressed up casual style of this outfit! 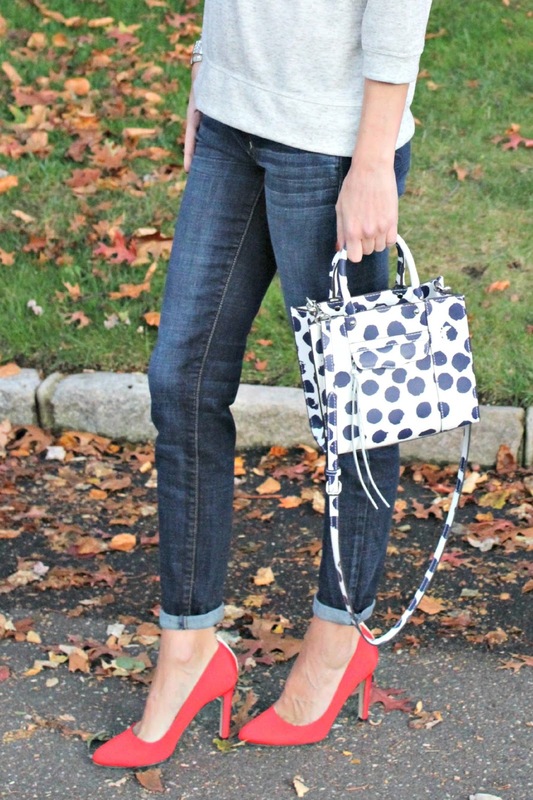 The bright red heels and sweatshirt combination is perfect and I love the print mixed in by your bag! Thank you! I love this sweatshirt! It's so chic! I love everything about this look! The sweatshirt and little bag are so cute! The heels and red lipstick add the special touch to the look! You look really pretty! Have a great weekend! Thank you! I'm so glad you like this look! You look lovely! It is a good outfit! In love with the tongue in cheek pun, it looks lovely on you, Michelle! 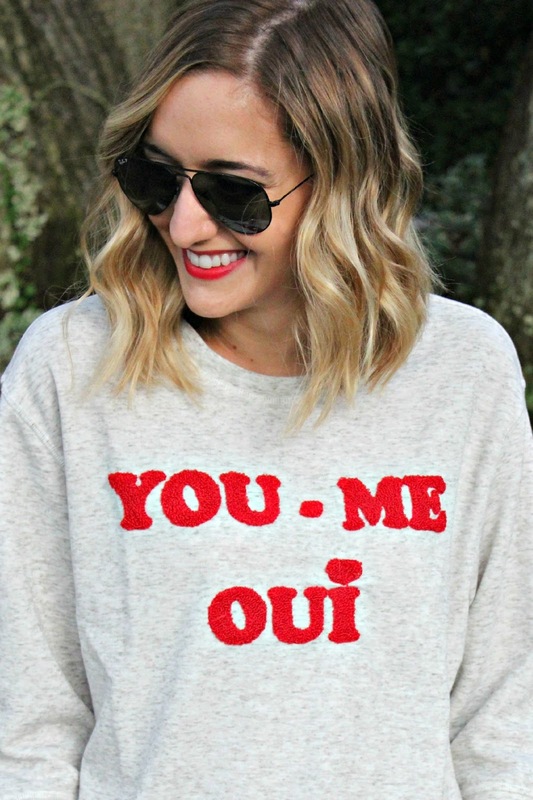 Me too - I am obsessed with this sweatshirt! So cute! Those heels are a beautiful colour. They really add some pop to the outfit! These shoes are one of my favorite pairs! They add an element of fun to every look! This is such a cool sweatshirt. I love how you styled it with red heels and the fun bag. I am officially in love with Zoe Karssen! Love the matching with the red heels, and your hair is too cute! This jumper is so cute. I love catch phrase jumpers and tee's but haven't quite got round to getting one yet. Haha oops. Me too - graphic pieces are so much fun! You are adorable with the red shoe and lip...perfect for the weekend! So cute :) I love the polka dots!! nice look, have a nice weekend. 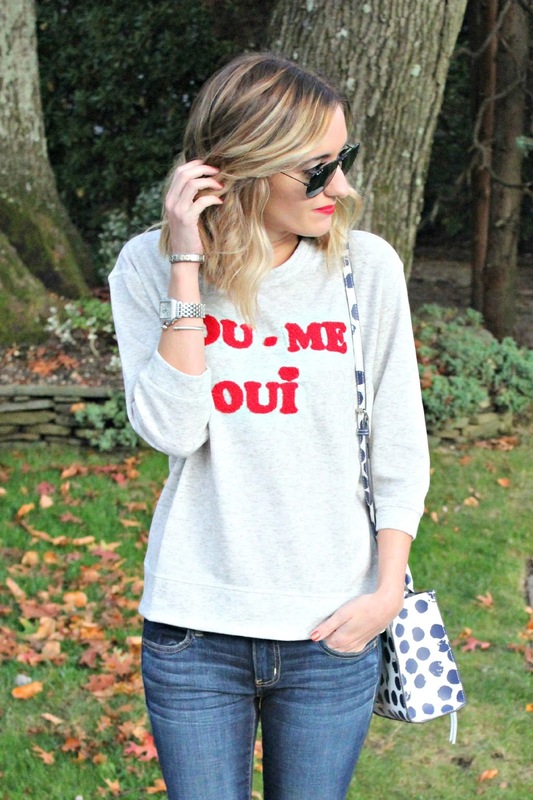 love how you styled your sweatshirt! super cute! Very lovely! Hope you have agreat Monday! 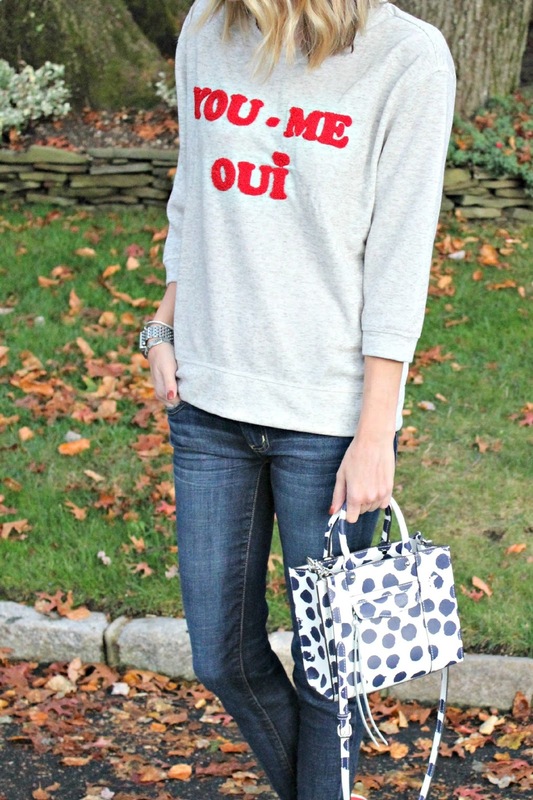 This is such a great look on you, love the pops of read, the saying on the shirt and those red heels!! How fab is this sweatshirt? I love how you dressed it up with red heels and red lips! Thank you! Isn't it amazing?! & it's on sale now! Thank you so much Mari! You are so sweet! Casual looks sometimes let your natural beauty shine through the most!